Conquer the world of wrestling in WWE Champions Free Puzzle RPG. In this game, you can finally play with all your favorite wrestlers in the world, build the unbeatable team you’ve always to see and fight the most intense wrestling matches to ever take place. How does the gameplay work? All your moves and successful blows in the wrestling match are dictated by how well you do in the puzzle game. Match 3 or more pieces of the same type, build up energy and create combos to deal more damage! If you master you technique, you could finish a match in under 5 minutes! Watch the fight unfold as you unleash legendary signature moves like John Cena’s Attitude Adjustment and The Rock’s legendary Rock Bottom. There are tons of wrestlers to choose from and you’ll unlock many more as you go along. Your dream team can be made up of any wrestlers you want! There are modern and classic fighters from the 80s and 90s like The Rock, Undertaker, Macho Man Randy Savage, John Cena, Triple H, Big Show and Andre The Giant. Teach your fighters new epic moves and improve specific skills. Customize your characters to better fit your play style! Join forces with your friends and conquer the world of WWE together! Help each other and swap gifts that will help you on your path to victory. Tag team with your friends to beat your opponents or simply go head-to-head to see who the best player is! There is new content coming out on a weekly basis, so make sure to step into the ring regularly! Even upcoming WWE Monday Night RAW and Smackdown battles will be transported into the game, so you can recreate your favorite wrestling moments in the game. 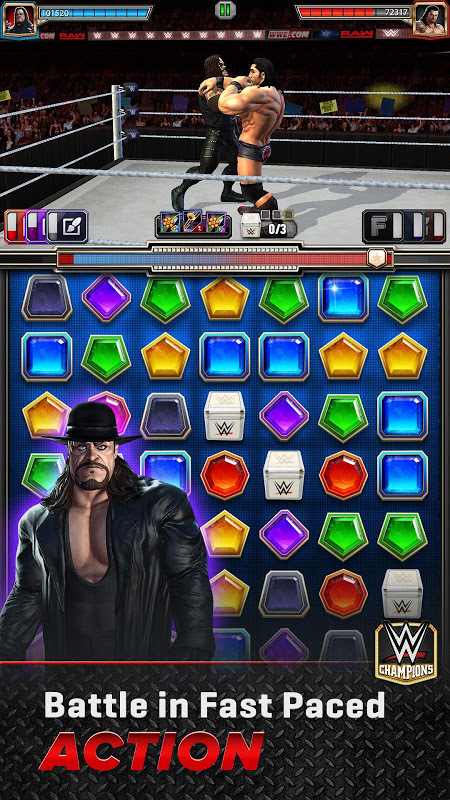 WWE Champions Free Puzzle RPG is an addictive game that takes you to the heart of the WWE universe and gives you the chance to become a wrestling legend!  Is WWE Champions Free Puzzle RPG yours? Claim it!